The setting is a Victorian Era English boarding school where strange and sinister events are abound. It is the classic hero’s journey featuring a young man with extraordinary abilities who must face down a powerful enemy and battle dark, mystical forces. There are magical special effects, memorable characters, beautifully understated performances, and a great musical score. The above could easily be a logline for “Harry Potter”, but the movie being described is “Young Sherlock Holmes” (1985), a neglected and criminally underrated fantasy adventure that features an equally underrated soundtrack by and underappreciated master composer. You get the picture. “Young Sherlock Holmes” came to market boasting impeccable credentials; produced by Amblin Entertainment—executive produced by Steven Spielberg, Frank Marshall, and Kathleen Kennedy—directed by Barry Levinson, and written by the red-hot young scribe of the day, Chris Columbus who was hot off of “Gremlins” (1984) and would go on to direct the first two “Harry Potter” films. The casting is superb— Anthony Higgins, Sophie Ward, Alan Cox, and especially Nicholas Rowe as the title character. Barry Levinson’s spot-on understated direction and superb pacing make the most of Chris Columbus’s intelligent, character-driven screenplay. The special effects are outstanding—and by that I mean they still look amazing today—especially a jaw-dropping sequence where the image of a knight on stained glass window jumps to life and makes cinematic history as the first CGI character ever. This a movie that had everything going for it and yet premiered on December 4th, 1985 to vindictive reviews and empty theaters. So what happened? To understand this you have to go back to late 1985 and understand the political environment around the movie industry. There was a huge Spielberg backlash underway—one that unjustly resulted in the bearded one being snubbed by the Academy for “The Color Purple”. 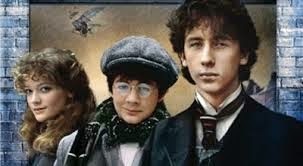 “Young Sherlock Holmes” was the third film of the year to bear the “Steven Spielberg Presents” moniker, following “Back to the Future” and “The Goonies”. “Back to the Future” was an instant classic but “The Goonies” was not held in the high regard it is today. Almost anyone over the age of eight found the film grating (the preview audience I saw it with booed) and a few bold critics decided to take on Spielberg by blaming him for attaching his name to such a sloppy film. On top of all of this “Amazing Stories”—the innovative anthology television series—debuted on NBC in September of 1985 amid a swarm of hype beyond anything you can imagine today. Remember this was pre-internet, pre-AMC, pre-everything—there were three major networks and that was it. When the first episode of Amazing Stories aired—“Ghost Train” directed by Spielberg himself—it and he were savagely attacked by critics. Television reviewers had broken the seal by trying to belittle the movie god. This opened up the door for film critics and the entertainment elite, who were seething that Spielberg was adapting “The Color Purple”, to take him on. After that, every reporter, critic, or jealous Hollywood contemporary who had bitterly sat back and watched the rise of the phenom who had taken the world by storm ten years earlier with “Jaws”, let loose their wrath and attacked. These were the circumstances surrounding the opening of “Young Sherlock Holmes”. Add to that the fact Paramount Pictures had no idea how to market the film (so they simply did not bother), and the result is a forgotten movie, barely seen—and a fantastic film score, rarely heard. Actually never heard outside of the film. At least not in a proper commercial release—not until now. 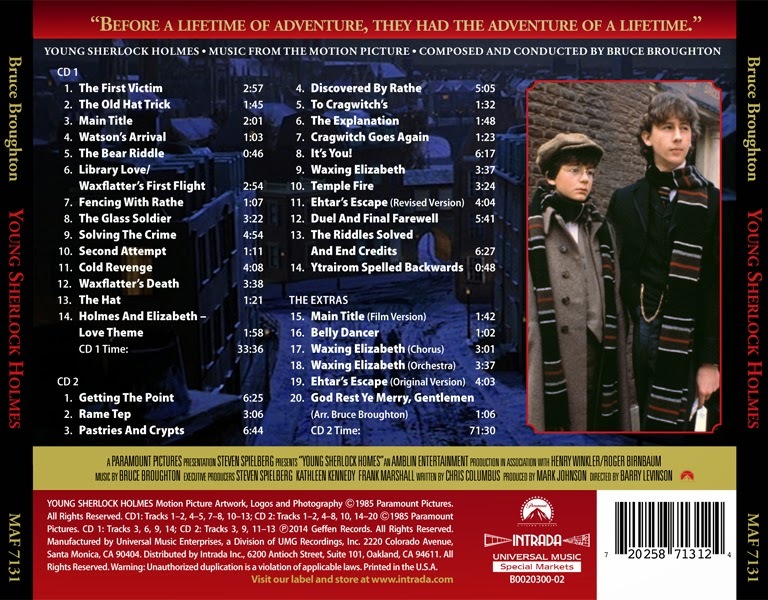 One of the true Holy Grails of soundtracks—Bruce Broughton’s superb, majestic musical score for “Young Sherlock Holmes” is at long last available in a dynamically produced and packaged two-disc soundtrack presentation. Featuring a knockout, heroic, soaring main theme that is so flexible, fluid, energetic, and emotionally resonating, it is expertly employed throughout the score with a variety of tempos and orchestration choices and used for action, suspense, and even romantic moments. There are so many highlights and so many magical moments in this soundtrack, it would take a book full of essays to do it justice. Bruce Broughton does so many things—gestures and choices no composer working on the “A” list today would ever even think of outside of John Williams and maybe Howard Shore. The way brass is featured and how crisp and alive and organic the instrumentation sounds—how the orchestrations are clear and uncluttered—how there is vertical movement in the music, as opposed to the linear droning dominating almost every score you hear today. Broughton can write action music too—thunderous brassy cues that rock with urgency and adrenaline. Disc one opens with back to back exciting cues with “The First Victim” and “Old Hat Trick” before introducing the instantly memorable main theme in “Main Title”. Track 6, “Library Love/Waxflatter’s First Flight”, gives us a sneak peek into the score’s moving love theme and a touch of soaring flight music to be used later in this soundtrack and developed further in another Broughton masterwork he would go on to do in 1986, “The Boy Who Could Fly”. Track 7, “Fencing With Rathe”, is one minute and seven seconds of pure heroic joy and track 9, “Solving The Crime”, is a vertical, energetic, emotionally vibrant, super-strong statement of the main theme with a wondrous euphoric afterglow. In the final track of disc one, “Holmes And Elizabeth”. Broughton gives us the full version of his love theme hinted at earlier—and it will break your heart. Disc two is jam-packed with so much excitement, melodic wonder, scary suspense, and furious action music—it simply must be heard to be believed. This is a rare talent, a star composer in command of the orchestra operating at a creative peak. 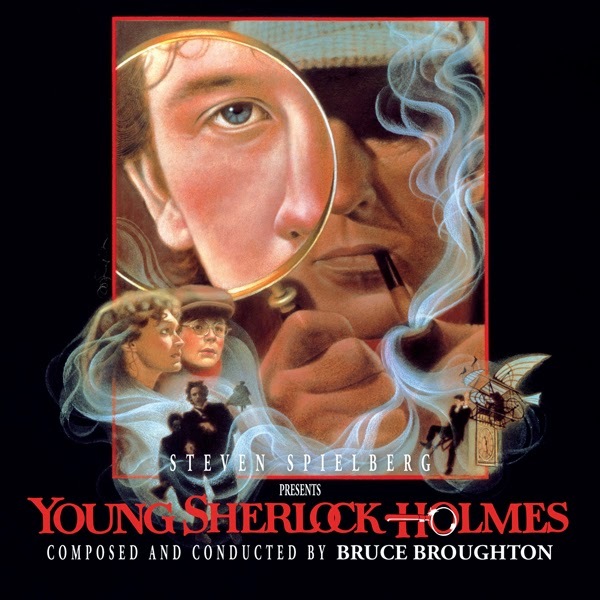 “Young Sherlock Holmes” is such a confident score. Broughton is never afraid to push it and go for the big emotions and big scares. “Waxing Elizabeth”, “Temple Fire”, and “Ethar’s Escape” are the most exciting action adventure cues not composed by someone named Williams. Another thing Broughton does so well is bring his score to a crescendo, interweaving all of the various motifs, themes, and melodies into a carefully crafted sequence of final cues that moves us and allows the film—and the listener—to reach an emotionally satisfying place. Bottom line: Bruce Broughton’s “Young Sherlock Holmes” soundtrack is a bold, melodic, exciting, wondrous score that takes the listener on a musical journey. It is a classic that stands right alongside Broughton’s other ‘80s masterworks such as “Silverado” (1985), “The Boy Who Could Fly” (1986), and “Harry and the Hendersons” (1987).